CELEBRATION, FL. – This year, unwrap a holiday adventure for the whole family: a cruise aboard the Disney Magic, Disney Wonder, Disney Dream or Disney Fantasy, all decked out with holiday cheer. – “Mickey’s Tree-Lighting Magic” in the atrium lobby on the first night of the cruise, where Disney characters lead holiday carols and the lighting of the glittering, three-deck-tall tree. – “Santa’s Winter Wonderland Ball” in the atrium lobby, where Disney cruisers welcome the guests of honor, Santa and Mrs. Claus, with a grand celebration featuring Broadway-style entertainment, favorite Disney characters and classic holiday tunes. This evening of enchantment is made complete when a special pair of royal sisters joins the party and causes a flurry of “frozen” fun as a magical snowfall overtakes the atrium. – Dickens-inspired carolers carrying the spirit of the holidays throughout the ship while singing holiday classics, sometimes with the help of favorite Disney friends. At the end of the cruise, children will have the opportunity to join the carolers onstage for a special farewell show. – Family holiday activities including building gingerbread houses and meeting Santa Claus. – Youth holiday crafts such as decorating stockings and gingerbread men cookies, making holiday cards and creating holiday animation cells. – “Deck the Deck Holiday Party,” a tropical celebration with Disney friends leading games such as hula hooping and limbo under oversized candy canes, along with dances for the whole family like the “Yuletide Slide” and a conga line around the pool. 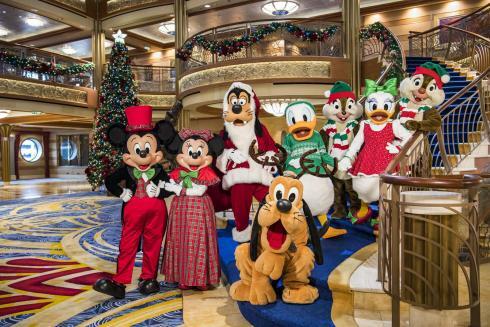 – A special holiday edition of the cheerful farewell celebration on the final night of the cruise, with beloved Disney characters and the ship’s crew in an engaging musical finale led by Mickey Mouse.